Time-limited 70 % special discount for Whitelabel version ! 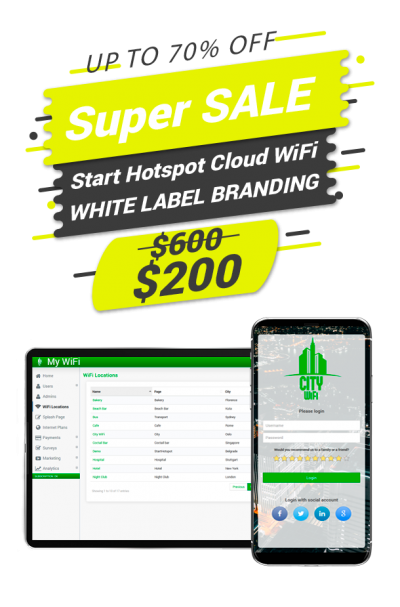 If you would like to run your own Cloud WiFi without a big investment, White Label branding is a perfect solution. You can run the same service with your own brand and manage the end user experience. Whitelabel means that Cloud system works on your domain name, emails are sent from your domain, and it can be used for multiple locations and demonstration purposes. When customer is ready, you can provide just a preset router. This allows high pricing flexibility as you are not tied to our official pricing – you can bill your customer more, for both service and your support.